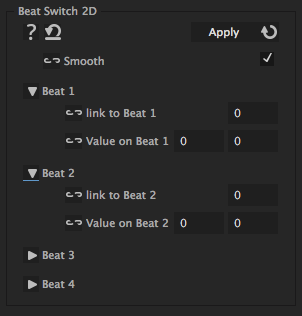 The Beat Switch 2D allows a 2D property to react to more than one beat simultaneously. The reaction to the beat can be completely different for each of them. In particular, the reaction to each single beat can again be controled by a separate, individual iExpression. controls the behaviour if several different beats overlap in time. Without 'Smooth' the result changes apruptly from the value of the one beat to the value of the other, whereas with the 'Smooth' option there is a smooth transition according to the 'Fade In' and 'Fade Out' parameters of the different beats. must be linked to the first beat signal on which the property should react. is the value that the property should take when the first beat is active. You can link here another property with a separate iExpression if the reaction to this beat should not be a constant value but instead be controled by another iExpression. must be linked to the second beat signal on which the property should react. is the value that the property should take when the second beat is active. You can link here another property with a separate iExpression if the reaction to this beat should not be a constant value but instead be controled by another iExpression. must be linked to the third beat signal on which the property should react. If you need less than three beat signlas you can leave the default value 0.
is the value that the property should take when the third beat is active. You can link here another property with a separate iExpression if the reaction to this beat should not be a constant value but instead be controled by another iExpression. must be linked to the fourth beat signal on which the property should react. If you need less than four beat signlas you can leave the default value 0.
is the value that the property should take when the fourth beat is active. You can link here another property with a separate iExpression if the reaction to this beat should not be a constant value but instead be controled by another iExpression.